The ViewSonic PJD6683ws is an advanced networkable, wide format, short throw DLP projector ideal for classroom and corporate environments. With its short throw lens, the projector can project a 90" image from only 3 feet away. Having the projector close to the screen eliminates cast shadows and blinding light for presenters. PJD6683ws delivers amazingly bright, clear widescreen with WXGA 1280x800 native resolution, 3,000 ANSI lumens and 15,000:1 high contrast ratio, while BrilliantColor technology provides vivid, vibrant colors. This networkable projector is equipped with Crestron e-Control and RoomView Express, making it easy for IT managers to monitor and control the projector from their workstations. In addition, the projector is AMX Device Discovery certified which enhances it to be a robust network projector for any size of campus or enterprise. With the new DynamicEco technology, presenters can control audiences focus by dimming the brightness down to 30% with a simple click of the remote. The PJD6683ws also comes standard with multiple PC and video inputs including HDMI, 120Hz/3D-Ready and 10w integrated speaker. The PJD6683ws widescreen, networkable, short throw WXGA DLP projector delivers outstanding projection performance for both education and businesses. The ViewSonic PJD6683ws is an advanced networkable, wide format, short throw DLP projector ideal for classroom and corporate environments. With its short throw lens, the projector can project a 90" image from only 3 feet away. Having the projector close to the screen eliminates cast shadows and blinding light for presenters. PJD6683ws delivers amazingly bright, clear widescreen with WXGA 1280x800 native resolution, 3,000 ANSI lumens and 15,000:1 high contrast ratio, while BrilliantColor technology provides vivid, vibrant colors. This networkable projector is equipped with Crestron e-Control and RoomView Express, making it easy for IT managers to monitor and control the projector from their workstations. In addition, the projector is AMX Device Discovery certified which enhances it to be a robust network projector for any size of campus or enterprise. With the new DynamicEco technology, presenters can control audiences focus by dimming the brightness down to 30% with a simple click of the remote. The PJD6683ws also comes standard with multiple PC and video inputs including HDMI, 120Hz/3D-Ready and 10w integrated speaker. 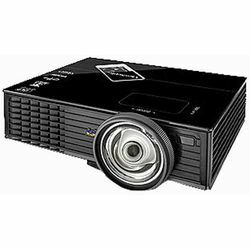 The PJD6683ws widescreen, networkable, short throw WXGA DLP projector delivers outstanding projection performance for both education and businesses.